Recently on the blog we posted an update on how the new Black Hops brewery is progressing. We briefly discussed some of the new brewing equipment required to meet our up-scaled production targets. But that was only scratching the surface. So in this 2-part post we’ll dig into our specific equipment we are running with for BHII. In this post we’ll go through our brewery setup, before digging into filtering, kegging and canning in Part 2 shortly. Having just received our equipment yesterday, we also have a few pics of the new gear. Here’s a quick vid of some of the new gear going in. 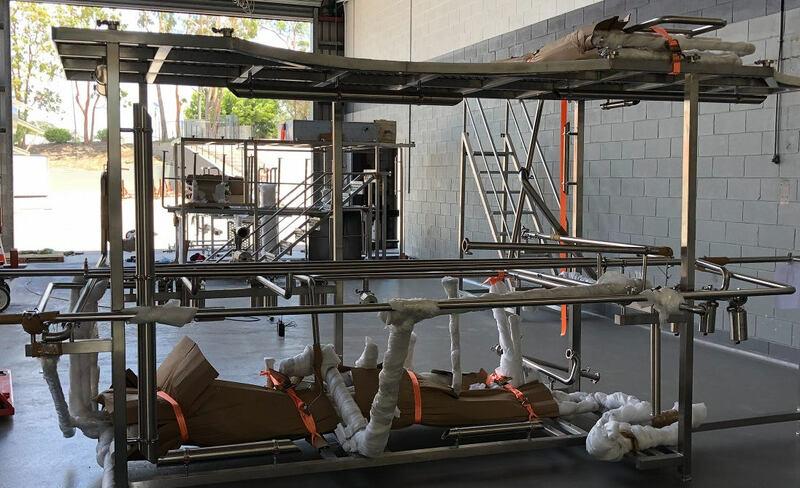 Working with Alpha Brewing Operations from the U.S., we’ve vastly increased our size, quality and automation capabilities with this new batch of brewing equipment. 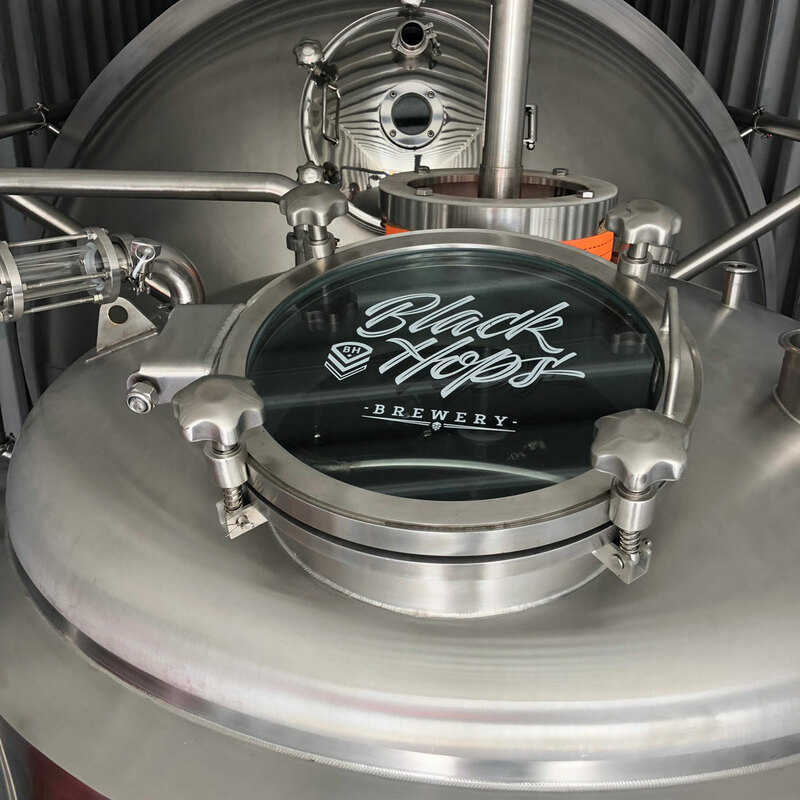 Both our breweries will use the same principles to brew beer, but with Black Hops II we’ll be refining our processes with the enhanced automation (and subsequent long run cost savings) to ensure our processes are a bit more refined. This will help us achieve better repeatability and longer shelf-life at a larger scale. Let’s start at the beginning of the brewing process, with malted barley and our first piece of equipment, a Grain Silo! We’re getting a 50 tonne outdoor silo, which is typically used to hold wheat. But because barley is a larger grain, our silo will end up holding about 35 tonnes of barley – which is still big in our book! Having our very own silo will allow us to buy our base malt, ‘Barrett Burston Border Pale Malt’, (which goes into every Black Hops beer), in bulk truck deliveries. This will considerably reduce our cost price per kg and remove the need to manually handle large quantities of grain bags. It will be connected to our brew-house with a state of the art chain-disk auger, which automatically carries the grain from the silo to our grain mill, where it will be cracked open. The chain-disk auger can transport the malt at low noise levels, across long distances and horizontally and vertically (90 degrees) through tight angles without damaging the grains. The grain is then lightly cracked by running it through our 2-roll grist mill, which has a ‘precision adjustment’ feature that will give us a high extract yield efficiency, providing further cost savings. The malt is then fed into another chain-disk auger system, which then delivers it to our mash tuns as required. Obviously this is not a small cost to set up, but the benefits are immense. We’ll be milling the grain and mashing-in much more efficiently, on account of eliminating a lot of the current manual, labour heavy processes. Plus we’ll be gaining cost savings on the raw materials. You can often work with your malt supplier to help contribute to the cost of the silo through your malt supply agreement, which is a cost-offsetting option we may look into. From here we get into our mash tun, which is the first tank in our 4 vessel brew-house. The mash tun we’ve chosen has a nominal capacity of 40 BBL’s or about 5,000 litres, which has been designed to handle a larger grain bill, with additional head space to allow us to brew higher gravity beers with ease. It is steam-jacket heated and fitted with an automatic strike water and sparge water temperature controller with flow meters, to allow for accurate and repeatable mashing and sparging. Its large, stainless motorised agitator will deliver continual motion and uniform temperature. It also has a 4hp Inoxpa flexible impeller pump with 2” in-outlets, to deliver the mash into the lauter tun upon completion. The lauter tun is our second vessel. It’s sized extra wide to also allow for higher gravity beers and comes with a removable stainless-wire false bottom for effective grain separation. Our lauter tun has a gear motor-propelled rake and grain plow for the removal of spent grain and for fine cutting the bed (which prevents wort channelling and bed compaction.) It also has multiple inlet spray jets, which will improve run-off clarity by clearing grain particles from under the plates and helping to create a floating mash. Another feature is a multiple wort drain ring system, to prevent channelling of the wort. These are all easily removable for periodic disassembly and deep soak cleaning. And high efficiency LED interior lighting will let us see what’s going on in the tank via a tempered glass man-way. The vorlauf and runoff is controlled by an automatic level controlled glass wort grant and pump. This feature prevents the grain bed from compacting and frees up the brewers to carry on with other tasks. This also has sanitary tri-clover fittings and a CIP spray ball fitted for easy cleaning. The lauter tun then feeds the clear wort into one of our two combined kettle-whirlpools, which are steam jacketed with individual zone control for efficient heating. Having two vessels allows us to increase our output – while one kettle is boiling, we can be filling the other with the next batch, which means more frequent knock-outs and therefore, more beer brewed in a day! Being able to produce exceptionally clear wort is very important when brewing clean-tasting, shelf stable beers. So the kettles have a tangential whirlpool outlet to separate the trube (hop and protein matter coagulated during the boil) into a neat pile in the middle of the kettle floor. This allows us to knock-out the finished clear wort behind the added protection of a trube dam separator. 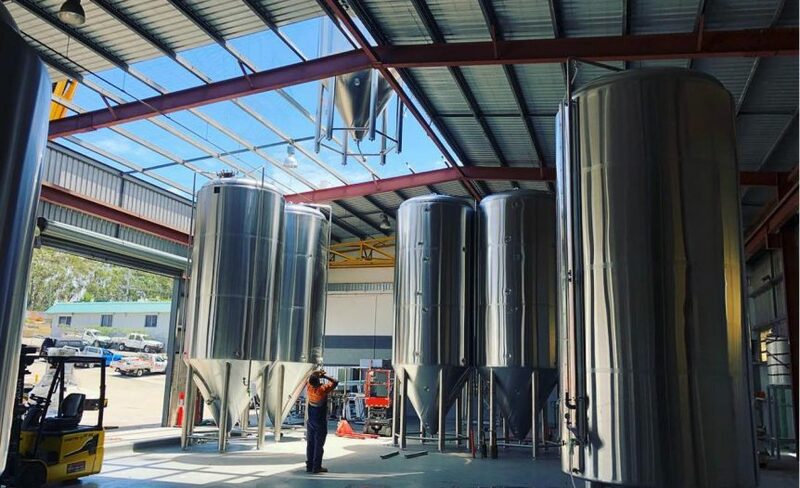 The brew-house tanks are connected by a large, elevated stainless brew-deck with two stepped entrances, which is controlled by a 12 inch touch screen panel with programmable logic controls. The brew-house can also be monitored remotely via ethernet or wifi on a computer or handheld device, which can also control certain functions. The mash tun can be programmed to run and store our beer recipes. There are also built-in hop addition timers and timer settings for automatic rake control. The temperature controllers are auto-tune PIDs with the built-in smarts to close the steam valves at the appropriate time, to compensate for residual heating lag. All transfer valves are air actuated and the steam valves are motorised for precise control, so that they won’t open and close abruptly. There are also liquid blending flow meters / totalizers for incoming water, one for each kettle and one for fermenter transfer. They come with remote digital displays so the brewer in charge can see the necessary data for the brew-house in one easy station. To keep the shiny new stainless tanks clean and hygienic, we have several CIP (Clean In Place) solutions. 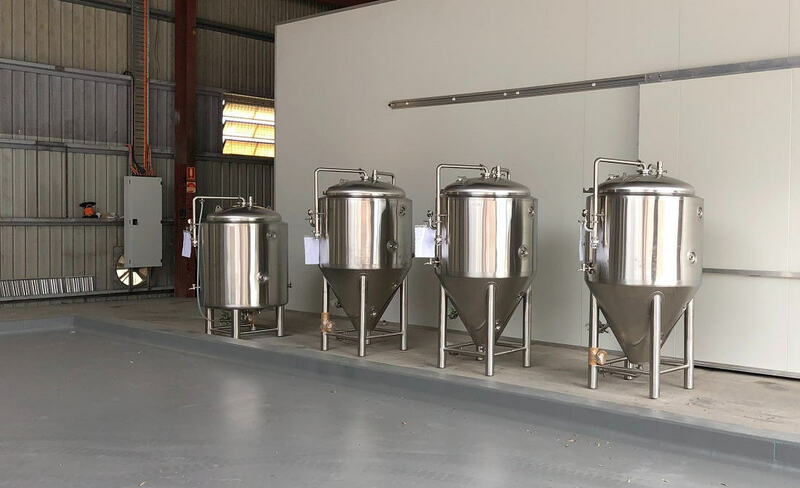 In addition to the brew-house pumps, each vessel in the brew-house is fitted with an internal rotating spray ball, which can be used to clean the tank interior with water and chemicals. The Fermenters and Bright Tanks also have CIP spray balls and we can also clean and sanitise them with our 300 litre mobile cleaning cart. This has 2 vessels (1 for Caustic and 1 for Acid) and a pump to select which process to perform. All we’ll need to do is simply wheel this cart to the desired tank and connect it with hoses to the attached pump. The water required for the brewing process will be held in two 120 BBL liquor tanks, one for hot water, which is steam heated and one for cold water, which is glycol chilled. These give us a 3 brew-length capacity, which means less stress when managing water on multiple brew days. The cold liquor (and all the fermenters/bright tanks) are chilled by a series of glycol pipes and valves that recirculate through a brand new G&D 100HP multi-stage glycol chiller. This refrigeration unit is oversized well beyond our initial needs in order to handle future growth and also provide high efficiency cooling. The Mash/Lauter/Kettle/HLT are heated with steam, and powered by a new ECS 500KW VWT steam boiler fitted with high-low modulation for efficient heating and fuelled by LPG stored onsite in a 4.3KL bulk tank. The completed brew then gets transferred into one of our six 120 BBL nominal fermenters, (which stand at almost 7 metres tall), through a heat exchanger running both cold water and glycol stages. That way the beer gets colder much quicker, and we can get it into the fermenter faster. The FV’s are all 304 SS TIG weld construction and polished to a sanitary interior finish. They’re pressure tested to 30PSI and fitted with pressure/vacuum relief valves to protect them. They also have 6 reinforced stainless steel legs, to help take the weight when the tanks are full. Rotating racking arms allow for increased yield and 2 inch drains make cleaning easier. On the front and top there are shadow-less man-ways for cleaning and dry-hopping and the top man-way has a UV-protected tempered sight glass for inspection. The rotating racking arm fittings have been switched out for BSP threads as opposed to the usual tri-clover to make them stronger and to reduce the risk of them being accidentally opened during rotation. The Fermenters and Bright Tanks are all controlled on a dedicated touch-screen cellar panel to monitor and set temperature points, which involves opening and closing the glycol valves to accurately maintain a specific temperature. This control panel can also be operated remotely, so we can check on and drop the temperature in a tank whilst sitting at the beach on a sunny Gold Coast Saturday afternoon – not that we’re gloating, haha! All of these small modifications and upgrades have been incorporated to decrease our brew batch time – time is money after all. We know that’s a lot of technical information to digest in one sitting, so we’ll sign off for now, but stay tuned for a follow up post, where we’ll take you through the new equipment specs relating to the final three phases of our brewing process – filtering, transferring to the bright tanks, kegging and canning. In addition to the main brew system, we got a complete pilot brewery. The 350L system comes with 3 700L fermenters and a bright tank. The system will enable us to continue our ‘Recon Series’ brews at the new location, and increase the output being double the size of our current pilot system. The brew house will sit in the brewery next to the big brew house, and the fermenters will sit in the taproom for everyone to check out while enjoying a beer brewed onsite. If you have any questions, feel free to hit us up in the Black Hops Ambassador group on Facebook.